Tony Smith's article, "Key WT 8 Amp Worldwide Survey Results" (MM28 pp.7-23) and Louis Meulstee's article, "Unusual Military Morse Keys", The AWA Review Vol. 8, 1993 pp. 39-41, inspired me to combine a few sources of information to elaborate on keys that were used with the Wireless Set No. 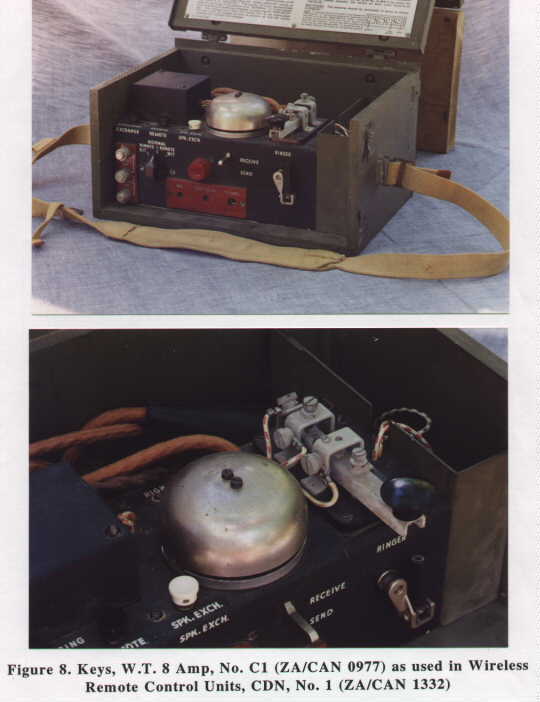 19, the workhorse Wireless Set of the Second World War. The Wireless Set (Canadian) No. 19 MK II used two types of Key and Plug Assemblies described as follows. The first type is the Key and Plug Assemblies No. 9, ZA/CAN/BR 0937 (Manufacturers # PC 90691C-1) as shown in Figure 2. Internally it has a three bridge Key W.T. 8 Amp No. 2. The second type is the Key and Plug Assemblies, CDN, No. 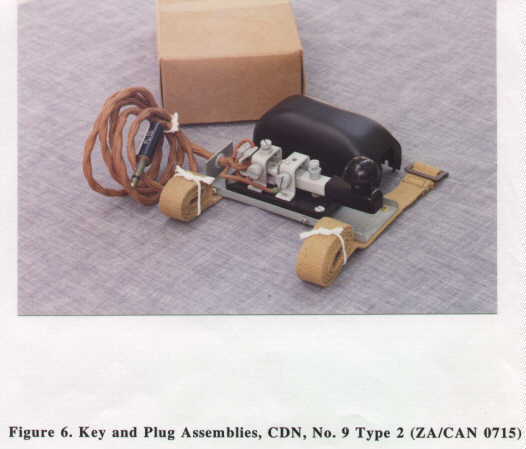 9 Type 1, ZA/CAN 1643 (Manufacturers # R 11950-1) as shown in Figure 4. Internally it has a two bridge Key W.T. 8 Amp No. 2 made by Northern Electric Co. The designation "Key and Plug Assembly R 11950" is stamped into the base from underneath creating raised lettering under the lever arm. Key and Plug Assembly, PC90691C-1 will be supplied instead of Key and Plug Assembly, R.11950 until present stock is exhausted. The Wireless Set (Canadian) No. 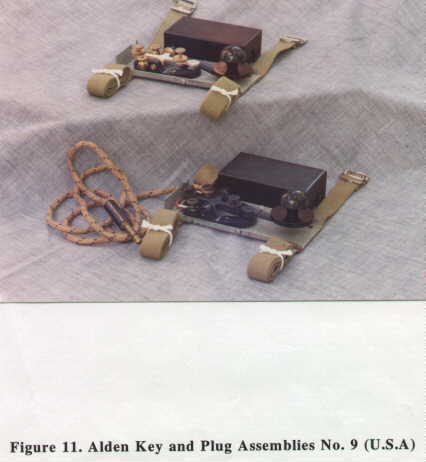 19 MK III also used two assemblies described as follows. The first is the Key and Plug Assemblies No. 9, ZA/CAN/BR 0937 already described above. 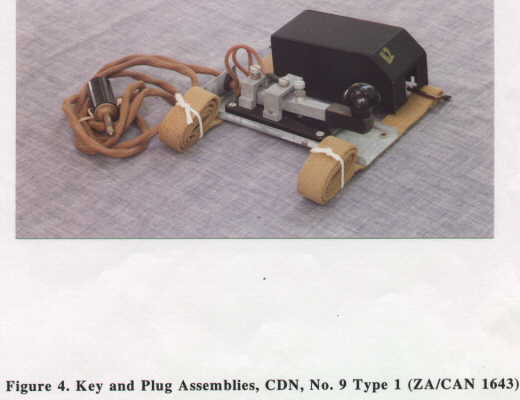 The second type is the Key and Plug Assemblies, CDN, No. 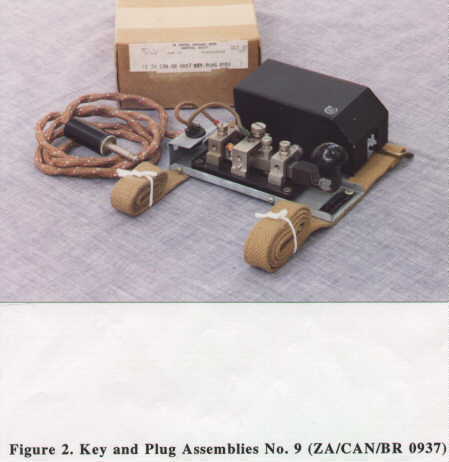 9 Type 2, ZA/CAN 0715 (Manufacturers # RCA 110072-1) made by Westclox as shown in Figure 6. Internally it has a two bridge Key W.T. 8 Amp No. 2 of pressed steel construction. Another key was used with the WS No. 19, in the Wireless Remote Control Units, CDN, No. 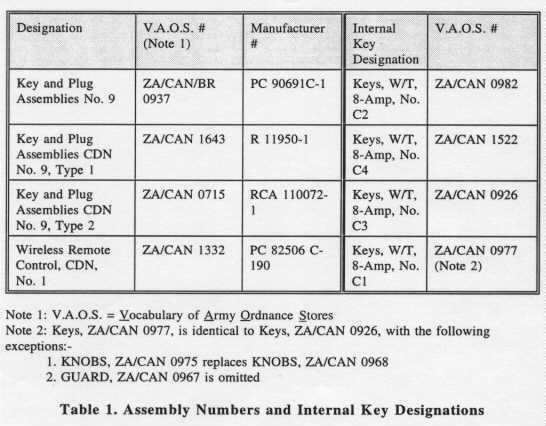 1 designated ZA/CAN 0977 (Manufacturers # RCA 111809-1) as shown in Figure 8. Note the different knob shape and lack of high voltage guard sleeve. Many readers would be interested in how the internal key designations relate to the assembly numbers. These are summarized in Table 1. And now for the variants! I believe that variants are the spice of any collection and we must have them all. What a quest! I have found several British built Key and Plug Assemblies No. 9 with the designation ZA 0937 on the cover but packed in a cardboard box with the designation ZA/CAN/BR 0937 printed on the label as shown in Figure 9. This indicates that the Canadians used British built keys interchangeably. The internal key has the designation Key W.T. 8 Amp No. 2 MK II. I have found slight variations in several of these Key and Plug Assemblies No. 9 as follows. 1. Standard plated base, flat black painted cover, Key W.T. 8 Amp No. 2 MK II designation on Bakelite base, cord is beige with red, yellow, and blue stripes. 2. Standard plated base, flat black painted cover, Key W.T. 8 Amp No. 2 MK II designation on Bakelite base, cord is dark brown with yellow, red, and blue stripes. 3. Standard plated base, flat black painted cover, Key W.T. 8 Amp No. 2 MK II ZA 2869 LMK designation stamped on lever arm, cord is dark brown with yellow, red, and blue stripes. 4. Standard plated base, flat black painted cover, Key W.T. 8 Amp No. 2 MK II designation on Bakelite base, cord is light brown with green, yellow and blue stripes, brass lever arm. 5. Flat black painted base, black wrinkle painted cover, Key W.T. 8 Amp No. 2 MK II designation on Bakelite base, cord is beige with no stripes. The United States of America also manufactured the Wireless Set No. 19 and had their own suppliers of Key and Plug Assemblies No. 9. namely, J.H. Bunnell (New York, New York) and Alden Products Company (Brockton, Mass). The "Tabular List of Replaceable Parts for the Wireless Set No. 19 - Mark II manufactured by RCA Victor Division of the Radio Corporation of America - dated May 20, 1943" lists the two assemblies under the designation 90691C-1. The J.H. 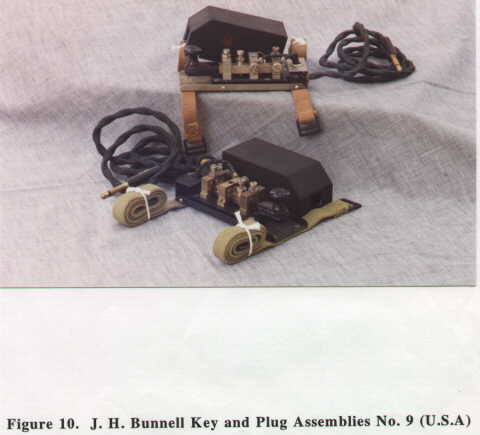 Bunnell Key and Plug Assembly No. 9 is shown in Figure 10 in two variations. The lower key has a black wrinkle finish base and the designation ink stamped on the lever arm, the upper key has a plated base with the designation stamped on the base under the lever arm and interestingly enough it has the Canadian Army designation ("C" with a broad arrow) stamped in red on the cover. 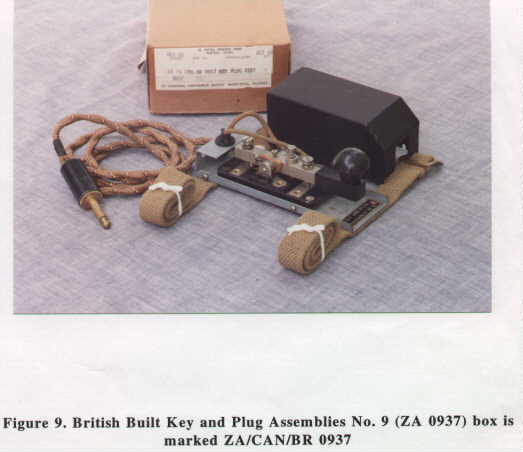 This means that this key was destined for use in the Canadian Army and represents a strong connection between US manufacture and Canadian use of Wireless Set No. 19 equipment. The Alden Key and Plug Assembly No. 9 is shown in Figure 11. Internally the key is a modified J-37 with the knurled lever set nuts moved internally to the frame to reduce width to meet the overall width requirements of the Key and Plug Assembly No. 9. Two variations are shown, the upper key has brass hardware components and the lower key has black painted hardware components. After many years of collecting, I believe I have found most variants of the keys that were used with the Wireless Set No. 19, but I would be glad to hear from readers with information on ones that I have possibly missed and any anecdotes that would help complete the picture. Although many variations of the keys for the Wireless Set No. 19 existed, it is reasonable to assume that these were not intentional variants. Lack of available materials and substitutions made during wartime manufacture, meant that equipment had to be made available for service in a timely manner. Fifty plus years later it is quite an honour to be able to sit back and ponder the variations from a collectors point of view. I dedicate this article to the Wireless Operators that no doubt had to use these keys under extremely adverse conditions. NOTE: This article has previously appeared in Morsum Magnificat, No 45, April 1996, pp 27-37. We thank G.C. Arnold Partners for permitting Chris' article to be posted here. Copyright � by Chris Bisaillion, VE3CBK, and Bob Cooke, VE3BDB. All Rights Reserved. Nothing on this page (or associated photograph pages) may be copied or distributed without permission of the author, Chris Bisaillion. In addition, credit must be given to those media in which the article has appeared, including this website. Thanks for honouring this request.